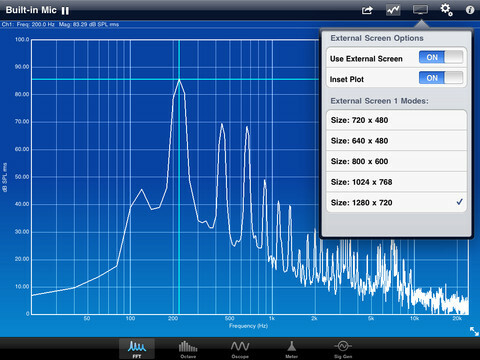 SignalScope Pro for iOS will turn your iPad or iPhone into a dynamic signal generator and analysis tool. With SignalScope Pro you can acquire audio data easily, storing data into MAT-files, ascii text files, PDF or JPEG images for later use. Now you can use your iPad or iPhone as an Oscilloscope, Octave band analyzer, FFT analyzer and as a stereo signal generator. The keyboard no longer covers the text boxes when editing amplitude and pan values in the Signal Generator tool. FFT’s are now performed with double precision (64-bit) arithmetic. Data entry bugs have been fixed in the Signal Generator tool. Help files have been updated. Oscope waveform data can now be exported to AIFF, CAF, or WAV audio files. The Excitation (signal generator) tab now supports the same color schemes as the analysis tools. Other cosmetic improvements have been made to the user interface. Users are prompted once to reset default microphone and headset input sensitivities. iOS 5 enables iOS devices to measure sound levels up to 120 dB with the built-in microphone and 130 dB with the headset microphone. Corrects default microphone sensitivities for iOS 5.